Taraji P. Henson is about to have all the ladies faces beat, slayed, and on fleek. Me, well I just need some lip gloss but so many ladies love the enhancements of make-up. 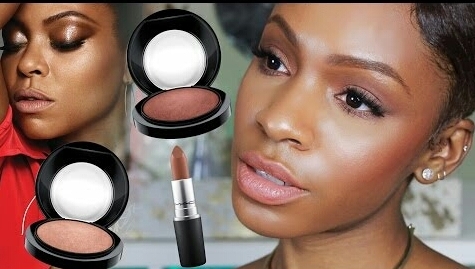 Purchase Taraji P. Henson Collection at MAC.com. Once again, Taraji got her hands full and adding to her dynasty. She has teamed up with MAC to launch her own make-up collection. On September 6, 2016 MAC Cosmetics teamed up with Taraji P. Henson to launched her namesake collection of make up. The six piece collection is all about the glow. Warm bronze and radiant highlighters are two main products but of course there is more. The collection also includes liquid eyeliner, matte beige lipstick with that 90's inspiration, mega volume masacara and for a flawless application a brush included. Experience the Taraji P. Henson look with her new make-up line. If you love make-up and want that Taraji P. Henson's glow or Cookie Lyon's killer eyeline designs; get over to maccosmetics.com. Taraji's MAC collection is available now. The prices varies depending on what you purchase from the collection. Taraji P. Henson at the MAC Cosmetics Chicago Event. Taraji is a woman living her life, working hard and continues being successful in all she does, touch and portray. Bronze and radiant Taraji P. Henson Collection. Taraji P. Henson always slaying any look. Please be the first to like, share and comment. Subscribe to sueboohscorner.com for your talk TV to me of your favorite TV shows.